It’s another post on 20 Lessons of my 20’s, Thank you so much for the amazing comments, Facebook shares, tweets and emails on the last segment! I’m ever grateful, If you missed it read HERE. 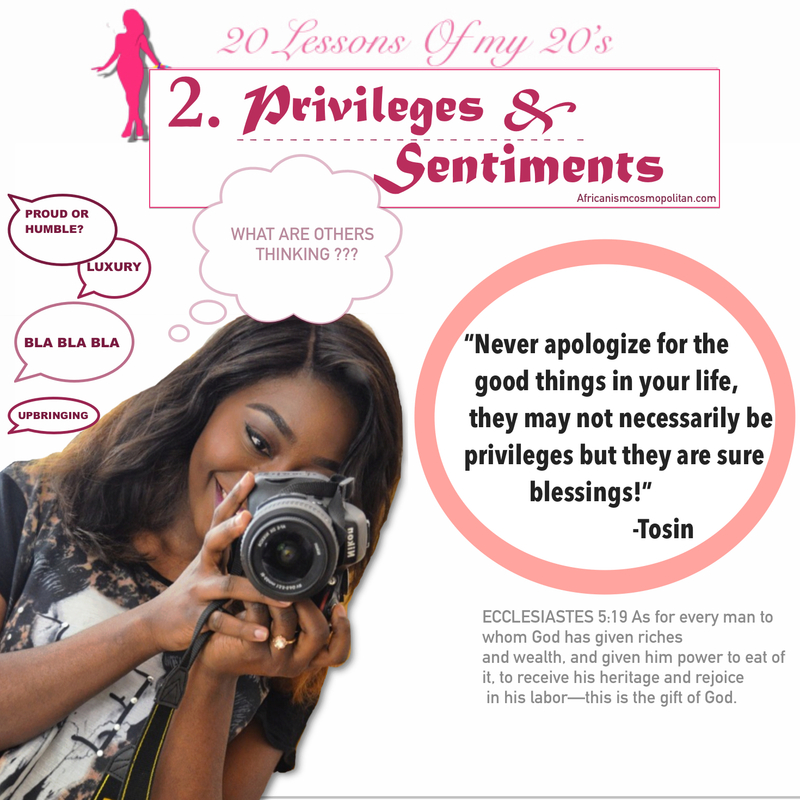 20 Lessons of my 20’s discusses various things I’ve learnt and I’m still learning as a young woman. Today’s discussion is one quite dear to me and ‘happenings’ this week inspired this topic as lesson number 2. The title Privileges and sentiments connotes, those that have/experience good things in their lives and the notion that you should be ‘humble’ A.K.A apologetic about those blessings. Cases in which sentiment has overruled reality and the word humble has been taken out of context. All ‘lessons’ are solely a result of my personal experiences, but I do hope they are valuable and worth sharing to someone else. Do have an open mind whilst reading…. 1. HAVE WHAT YOU WANT: Growing up I remember watching those Nollywood dramas that taught you when/if anything good happens, you shouldn’t share/tell anyone or else misfortune would come upon you……It’s funny how this cultural analogy has become the behavioural construct of most individuals when it comes to gratitude or expressing opinions about other people’s lives. This past year, I’ve learnt that people have the right to be who they are and want whatever they desire regardless of my sentiment, upbringing or interests. I had a conversation with someone the other day and I was telling her how I really would enjoy having the finer things in life i.e luxury. And If I could afford the jet set life, I would most likely indulge. She had this condescending response with the need to remind me how charity and philanthropy should be more important. I smiled because I couldn’t remember admitting to her that luxury was of utmost importance or charity was of less importance to me. I told her Giving, respect, morals, charity, and goodworks amongst others are values embedded in me that no amount of wealth can take away. Also I believe that discussing the philanthropic gestures I do/intend to do in the future doesn’t validate me as a good person, neither does not-talking about it make me less humane or charitable. But I then realised that this is where the cultural/non-cultural sentiment comes in. If one posts images or shares articles on charity works e.g visit to orphanages, community service or make public donations, they are tagged as humble/generous, or perceived as having a sense of purpose because they are ‘helping’ others. While if another looks nice/visits nice places and posts pictures, they are also often tagged as ‘show-offs’. In reality what’s the difference between the two scenarios? but you be the judge. I’m pro good works, but I often ask why people feel those who like/have the finer things in life are tagged Wasteful/proud/vain/flamboyant? I personally feel people have the right to spend their resources on what they want, either to give it away or spend it on themselves -it’s a matter of choice. However, it’s nice to give some, spend some and save some, but the truth is other people’s fund management is really not your business or mine. In fact, I think the greater problem lies with those who are quick to express such opinions as regards who is what and why. Many preachers in Nigeria today face this stigma, one can’t have a fleet of cars or landed properties abroad, without being discussed in tabloids as fake or flamboyant. I am one christian that believes that our greatest goal is not just to make heaven but also to have dominion while fulfilling purpose on earth. There is absolutely nothing wrong with having good things, Ecclesiastes 5:18-20 makes this sink. Hence, do not entertain those who sugar coat their lack of discretion/spite/envy with sentiments. Humility is acknowledging that you are not self-sufficient and more scriptural; its living with the understanding that you are purely a product of grace, subject to the will of God. I observed that the main reason why people are quick to tag others as proud/vain/self obsessed/arrogant is either because the accused really shows those fruits or the pointing finger is plainly spiteful . However, I got some instructions from my life manual on principles of living which have helped me to create a balance either when acquiring things, marketing my strengths or even publicly sharing comments/moments. Everyone comes naked from their mother’s womb, and as everyone comes, so they depart.They take nothing from their toil”. As a believer you should actually invest more heavily on your soul/inner man because everything vain depreciates, see 2 Corinthians 4:16. Further more, be of substance without possessions, let your appraisal be that which radiates God’s glory and precepts. A heart that speaks louder than acquisitions. i.e. in more practical terms, Strive for “she has integrity alongside She has nice clothes”. In totality, have a full dose of the fruits of the spirit: Love, joy, peace, forbearance, kindness, goodness, faithfulness, gentleness and self-control while having ‘dominion’ on earth. c. Mind your business: Tomilola Escada would probably resonate with me on this, we had a discussion a while ago about sharing opinions on others, and she shared with me a scenario where the Holyspirit asked her if the matter was really her business, and I laughed so hard. But then again it’s so true, apt and real. We all say ‘mind your business’, but do we really do? Someone does something you begin to ask yourself/friends why, you begin to analyse the lives of others either mentally or with buddies. I’ve been guilty of this in the past and I have refuted such behaviour. Meddling in the lives of others brings about idleness, gossiping, hate, discord, jealousy and unfruitfulness amongst other vices. There are also many scriptures on this but l would share just two. Proverbs 10:9 When there are many words, transgression is unavoidable, But he who restrains his lips is wise. Ecclesiastes 5:2 Do not be quick with your mouth, do not be hasty in your heart to utter anything before God. God is in heaven and you are on earth, so let your words be few. In essence what have I been on about? …Never apologize for the good things in your life, they may not necessarily be privileges but they are sure blessings! Be grateful, love others, serve and enjoy your life. That’s all for today, 18 more to go. I hope to one day publish these writings into a book/compilation, but until then it’s all for you my blog readers! Have a fruitful week ahead! Interesting read. Well done Tos Tos. Nuggets of wisdom to actually chew on. The thing is, I think a reason why people ‘look down’ on rich people especially preachers might be because they feel like they don’t do enough for the community around them. When it comes to church, I believe accountable should be an important aspect and i think this is mainly what people are not happy with. The disparity. Although, it seems like people forget that some of these preachers (e.g. pst Adeboye) started from the bottom. In regards to the reaction of your friend, i think people just buy into stereotypes and some ppl actually find the thought of being rich and christian contradicting. I think having a Godly attitude is important. But as you alluded 1cori 10:23 says it all. You are right! But however I feel those in important positions do their part it may not just be visible enough, but in hindsight how much help can one or five people render to a nation like Nigeria? lol May God help us. Thank you for commenting as always! U just got 5 stars from me…I remember having this discussion with a friend the day a blogger (linda) posted a pic of her brand new car. It was sad. I don’t understand why people who r always quick to comment and point fingers feel it’s only the responsibility of the rich to help the poor. What have you done in your own small way to help. There are soo many ways you can help people without necessarily giving huge chunks of money (voluntary work try that it works) but no they won’t, they sit back and judge!! I don’t remember God givn any1 the power to judge other people. This topic always gets me talking but will just end here for now. Let the change start from you!